Driving remains the most popular way to get to work, but there’s been a significant increase in the number of cyclists too. NEW CENSUS DATA released today shows that the time people spend travelling to work or school has increased across every county in the past four years. The national average commuting time in April 2016 was 28.2 minutes, up from 26.6 minutes in 2011. 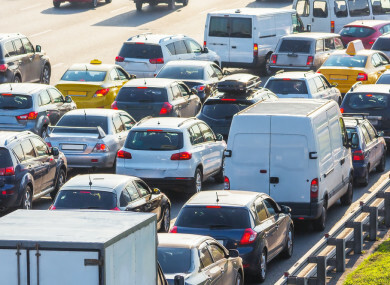 Commuters in counties bordering Dublin had the longest average commuting time, with those in counties Meath and Wicklow travelling for almost 35 minutes to get to their destination. But almost 200,000 commuters spent an hour or more commuting to work, which represents an increase of almost 50,000 on 2011 (that’s 31%). The census area of Laytown-Bettystown-Mornington, three towns in Meath, had the highest percentage of commuters with 28% of its 4,565 workers travelling during the week. That was followed by Skerries in Dublin (1,092) and Greystones-Delgany in Co Wicklow (1,855). In total, 2,962,550 people are travelling to work, school or college – which is an increase of 9.3% on the 2011 figure. 56,837 people cycled to work – that’s an increase of 43% since 2011. The number of primary school children commuting by bus fell by 7% compared to 2011. Those walking and cycling accounted for 25% of primary school commuters in 2016, compared with almost 50% in 1986. Among secondary school students, 43.3% went to school by car, while 28.4% used the bus. Over 42% of rural secondary students were reliant on the bus to get to school, compared to nearly 20% of urban students. College students had a fairly divided spread; 23.5% drove or were passengers, 24% used buses to get to college, while 26% walked to college. The number of workers crossing the border to Northern Ireland was 7,037 in 2016, up 10% from 2011. The number of students travelling across the border is at 2,299 for 2016, which represents a decrease of 26% on the previous census. Some 3,531 people stated on the 2016 Census form that their place of work was outside the island of Ireland. You can read the full set of census figures on commuting here. Email “There's been a 31% increase in work commutes that are over an hour long”. Feedback on “There's been a 31% increase in work commutes that are over an hour long”.